Salamanders live in rivers, swamps, forests and caves. Some spend their entire lives in water, while others migrate between water and soil for seasonal events like spawning. Different species of salamanders have varying habitat needs in captivity or in the wild, but all salamanders require moist environments to keep their skin from drying out. Active at night, they seek out cool and dark places to hide during the day. Aquatic salamanders remain in water their whole lives, usually preferring cool or cold habitats rather than warm. Most have gills. Some species have only two legs, and fins to help them maneuver. Salamanders such as hellbenders and mudpuppies prefer quickly moving streams and rivers, spending their days beneath rocks or logs. At night they emerge to feed on bugs, crayfish and fish. Other aquatic species, like sirens, prefer marshes, swamps and even drainage ditches, where they hide and hunt amid vegetation. Many salamanders are born in the water and metamorphose from larvae into adults, not unlike tadpoles. They then move onto land. Some species remain close to ponds, streams or pools; others venture further into humid forests. A few species lay their eggs on land, in hidden, damp areas. 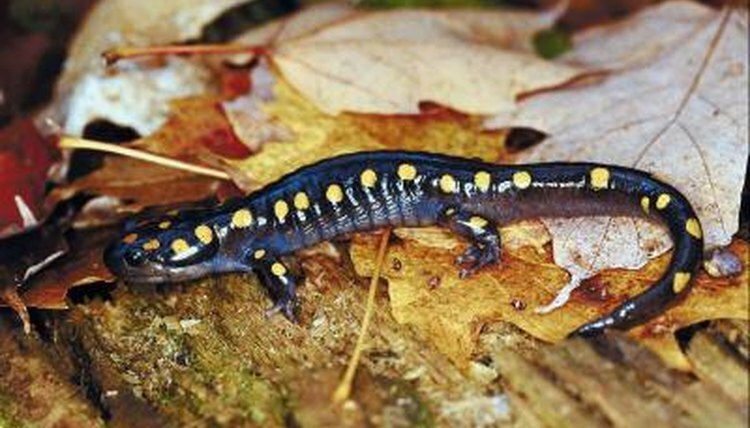 Terrestrial species such as spotted and tiger salamanders spend their nights beneath leaves, logs or rocks, and some dig burrows. Going underground also helps them conserve moisture if they need to and allows them to hibernate through snowy winter months. Unfortunately, salamanders are becoming increasingly rare. When wetlands are drained for construction or other human development, salamanders lose valuable habitat. If they’re unable to reach pools for breeding, their numbers decline. Stocking fish such as bass and bluegill, which prey on adult salamanders, has also affected populations. Environmental pollutants such as pesticides and other chemicals are a cause of disease and death. In fact, because salamanders are so susceptible to toxins, scientists observe their health to assess pollution levels. Pet salamanders need moist habitats with places to hide. If you plan to have such a pet, research the species to find out whether it's aquatic, terrestrial or a combination. Also find out what kinds of hiding places your salamander prefers: deep soil, rocks or leaves. Check your state and local laws -- in many places, it's illegal to catch and keep native species. At the pet store, buy only salamanders bred in captivity at a USDA-licensed facility.